The Velvet Underground Experience, an intriguing new multimedia art and music exhibition spotlighting the iconic band’s early NYC roots and opening in New York City on October 10th, has announced three exclusive new events to kick-off the exhibition’s opening week. The first exhibition dedicated to the Velvet Underground, The Velvet Underground Experience will host a Q&A with co-founder John Cale on October 11th, a walk-and-talk with world renowned French designer Matali Crasset on October 10th and a special concert by The Feelies on October 13th. As co-founder of The Velvet Underground, legendary musician John Cale will participate in a special moderated Q&A on Thursday, October 11th at 5 pm ET at the exhibition space. Seating is limited and will be first come first served day of event. During the Q&A, fans will be able to hear from Cale about the indelible impression the band had on the music scene in the 1960’s, his relationship with Lou Reed, the band’s lasting legacy and what it means to bring The Velvet Underground Experience to New York. At the end of the Q&A, the moderator will open up the floor for questions from the audience. On Saturday, October 13th, veteran indie rock band The Feelies will play a tribute concert performing some of The Velvet Undergrounds most iconic songs. The concert will take place across the river at the White Eagle Hall in Newark, New Jersey. Doors open at 8 pm ET with the band taking the stage at 9 pm. Tickets for the October 13th show can be purchased via Ticket Fly. To round-out the week, on Wednesday October 10th at 5 pm ET, the innovative French industrial designer Matali Crasset will host a special walk-and-talk through The Velvet Underground Experience where she will share her inspiration for the interior design of the exhibition and how she infused the band’s influence and spirit into the space – attendance space will be limited. 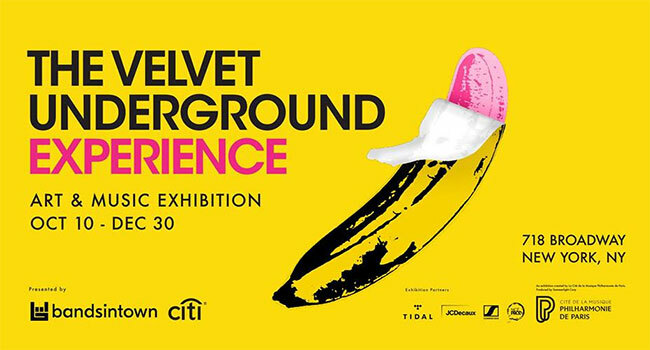 The Velvet Underground Experience is co-presented by Bandsintown and Citi.